I am considering using Jotform to support player registration for my football club. We have 20 teams of varying ages (child to adult). Once registered complete a player registration form(s). I can see it possible to create very good player registration forms but these would not be valid if not associated with a verified user. 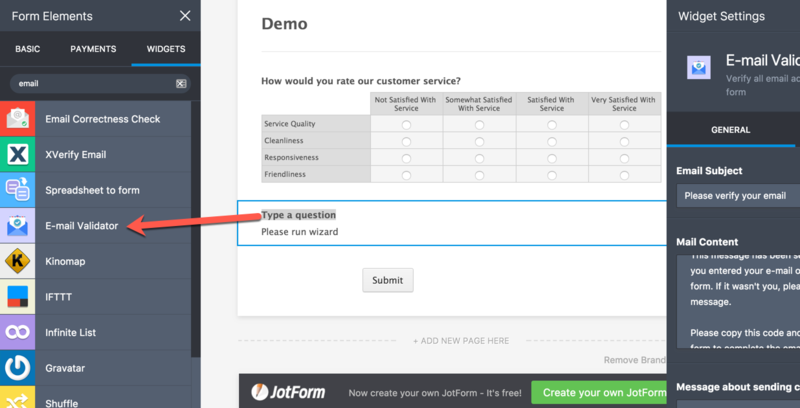 Yes, Jotform can verify an email address. You have two options. Email verification before form submission. Email verification after form submission. Essentially, the widget will require a user to verify an email first before the form is submitted. A verification code will be sent via email. For the second option, you can use the Submission Verifier app. It’s a longer process, but what this app does is it allows users to submit your form, regardless if the email is valid or not. Once the form is submitted, a link will be sent to initiate the verification. There is a nifty guide here which you can use to enable this feature. Please note that you can take advantage of our "E-mail Validator" widget. Please note that this widget sends a pass-code to the email address of the user entered on the form. User needs to copy the pass-code from their email in-box and paste it in the verification code input box on the form. Upon successful validation of the pass-code, user will be able to submit form. I believe this widget will fit into your requirement.